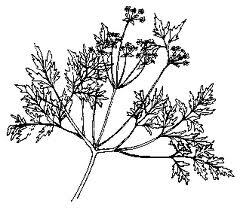 Chervil (Anthriscus cerefolium) comes in two varieties, one plain and one curly. The delicate light green leaves resemble parsley and have a subtle flavor that combines anise and parsley. Chervil flowers and goes to seed easily, especially in hot weather. It is better to plant this herb several times through the season than to try to keep it pruned to prevent flowering. Size - Chervil can grow 24 inches tall and 12 to 18 inches wide. Classic French herb used in salads and sauces. This is best started outdoors in cool weather. Fertilize every two week as it grows at a good pace. frozen or dried. 900 seeds per packet. This is an extremely easy plant to grow with a flavor reminiscent of Tarragon. It does fairly well indoors, as well as any herb that would rather have the wind on its leaves.